S-10 Forum > Specific Model Forums > 2nd Gen Forums > S10 / Sonoma > What is this plug for? Hey guy was playing around with the truck learning how to remove the headlights, grill and bumper I discovered a loose plug in front by the radiator and wondered what this plug is for? Re: What is this plug for? Ambient temperature sensor for a digital overhead console. Ohh I see where would do I plug it in too am I missing something? 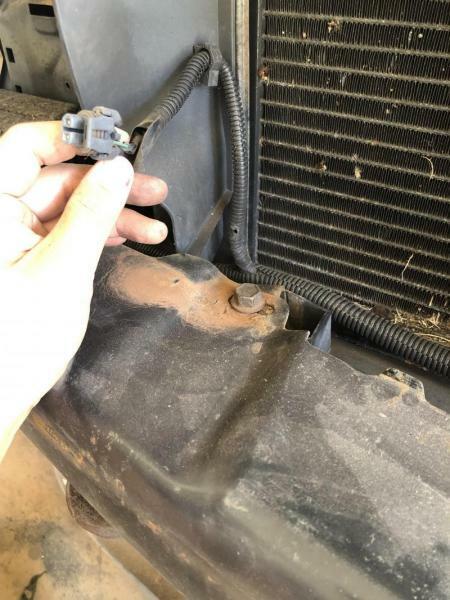 The sensor should be on the hood latch support. So if my over head display console is off it’s because there’s no sensor? So if I don put the sensor in and display is still black could it be something else like a fuse? I'd check all of the fuses....even if you know exactly which one it is...can't hurt. So if I don put the sensor in and display is still black could it be something else like a fuse? Did you mean do or don't? Where would the fuse location be for this over head console? Could it be in the fuse box located in the cab or the one under the hood? I should add that if the sensor is not plugged in, the overhead console will display "OC" indicating that the ambient temp sensor circuit is open. So if it's not displaying anything at all, it's not because the sensor isn't plugged in... there's another issue with it. The displays do go bad sometimes. I see I know I have issues with my headlight switch not illuminating my cluster would that have to do with anything in the overhead console also? I'll have to check the wires Blazer2 and see if the dimmer affects the overhead console. I'm pretty sure it does. I'm sure turning on the headlights does. I don't drive it often enough to be positive. You do have the dimmer wheel rotated up...right? Okay so driving today I noticed my overhead console was on even without the sensor installed but than later it would turn off and than would turn back on so I’m guessing it’s a connection issue so where would I start to look for looked connection for the overhead console? What kinda truck are we dealing with here? I see in the picture it’s a Generic Made Chevrolet without the grille. What configuration is this truck/suv?..crew cab? Xcab? Jimmy? If it's intermittently turning on and off by itself, more than likely the unit itself is bad, You could take it out and check all the solder joints on the board with a magnifying glass. So would that mean I would have to take down the whole over head console? Or can I just pull out the overhead display? Alright,makes more sense. Those overhead consoles are only on blazers&crews. I pretty much group them together as a subspecies of each other...electronically a crew cab is actually just a 4x4 blazer with a bed...they share the same harnesses&modules...ride pretty much the same too.